"Jason Blade...Every Woman's Dream...Every Criminal's Nightmare!" Jason Blade is back! As is the rest of the cast, crew, music and backdrop to the opening credits, as this and Day Of The Panther (1988) were shot back to back. In true “45% New Footage” style, Fists Of Blood opens with a recap of the events from the previous film, with some handy narration by Anderson (Stanton). However, it seems to me that if you watch this one first, you would still be confused by this unnecessary and time-killing, money-saving exercise. Continuing exactly where its predecessor left off, Jason (Stazak) and Gemma (Jefferson) have gotten serious in their relationship - so serious in fact that they are now working together on an anti-crime task force in their hometown of Perth. Despite some rockiness in their relationship, Gemma is still dancing up a storm and Jason is still foiling the bad guys with his martial arts skill. When the nefarious Baxter (Richards) escapes from Fremantle prison, he kidnaps Gemma and hides her away in an abandoned “steam factory”, the type of abandoned warehouse action movie fans know well. Jason must fight through an army of ninjas in multi-colored hockey masks to get to the final room to save the girl, just like in a video game. However, two new elements are introduced into this mix - while only touched upon in the first film, the idea of the psychic relationship between Anderson and Jason is fleshed out more. From his hospital bed, Anderson is able to telepathically communicate with Jason and warn him of dangers Jason can’t necessarily see, but Anderson can. We thought this was a fascinating and original concept that brought the level of the movie up. Additionally, there is the character of Sgt. Lucy Andrews (Wallace), who is working on dismantling the time bomb Baxter set. Oh yeah - if Jason doesn’t save the Gemma on time, a bomb will blow them all to smithereens. Can Jason Blade tangle with Baxter once more? This time around, director Brian Trenchard-Smith delivers a bit more offbeat humor. The brothel scene is wacky, and the aforementioned “Jason Ninjas” add to that. Wouldn’t you be scared if you were all alone in a steam factory with a time bomb about to blow, and a ninja with a multi-colored hockey mask starts moonwalking with a baseball bat? Jason Blade faces his toughest challenge yet as he tirelessly faces off with these and many other punks until the final confrontation with Baxter. Jason gets to do yet more training in his gym, Baxter takes a lot more punishment, and elements of the hostage drama are introduced in this installment. The idea of a bunch of special ops officers going into a booby-trapped warehouse while a mastermind picks them off one by one was later used in Jackie Chan’s New Police Story (2004). But like a lot of things in life, Jason Blade did it first. 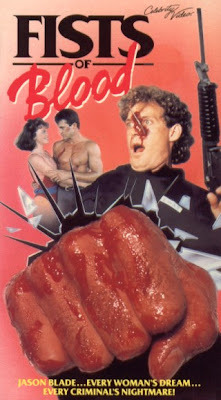 There are a lot of funny sounds in the movie, and I don’t know who won the Oscar for best sound editing that year, but it should have gone to the sound effects department of Fists of Blood. The original title of the movie was Strike of the Panther, which makes a lot of sense, but it was changed (there is a video-superimposed title) to Fists of Blood by Celebrity Video in the U.S. 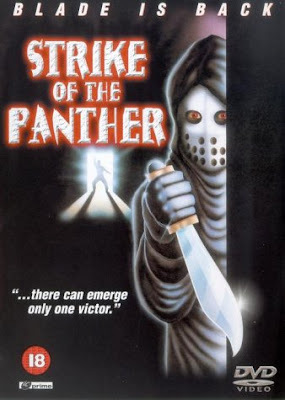 In other nonsensical box art news, it appears the British DVD tried to market the film as some kind of slasher horror, but that’s just misleading. The directly continued storyline means the two films make a great double feature, which is perhaps what was intended. This would be the last we would ever see of Jason Blade, and, just as mysteriously as he arrived in all our lives, he now departs. Gotta love the steam factory! It is a classic action movie staple! Have you seen Hands of Steel (1986)? I've only seen part of it, but it seems better suited to your site than mine. Not yet. Heard it is a lot of fun. It is in our pile of movies to watch. Hopefully we will get to it soon! That vhs cover is beautiful! And the movie sounds pretty cool. Your review makes me want to see it now! It is a killer cover! Thanks! Would be interested in your opinion!